Let’s start off at the same station and make a few things clear: Despite what is being tossed around on the internet, this case is not a slam dunk for either side (at least not evident from the statements being thrown back and forth). It is very likely that this case is going to go to trial, as there are a ton of allegations being made and accusations that are going to require the backing of email communications and witness testimony. We are not at the point in the case where either side is trying to convince a judge/jury, that won’t come for months down the road. What Cloud Imperium Games is doing with its response is attempting to have the case dismissed by convincing the judge that the accusations have no merit and including comments that there are no damages to be recovered regardless of Crytek’s claims of breach. Since this is a gigantic lawsuit, I wanted to go down the list of points that I found interesting so far. This is not comprehensive and will certainly be followed up with when more details are presented. With this lawsuit between Crytek and Cloud Imperium Games, it looks like we’re diving back into the Clinton era legal argument about what the definition of ‘is’ is. A major point of contention that Crytek is bringing forward in this lawsuit is the definition of exclusive, how it was applied when forming the agreement, and what exactly it means for both parties. CIG is naturally going to fight this claim, and understandably the wording in the license agreement is incredibly vague for the kind of contract where every line should be worded to remove any doubt or wiggle room for interpretation. To the layman, the wording of the agreement seems to indicate that the license does indeed require CIG to exclusively embed CryEngine and no other engine. As far as contracts like this go, however, such a definition of exclusive is not standard by a long shot. Exclusive in these sorts of agreements is generally understood to mean that Crytek would be granting the license to CIG alone and no other company in the agreement, rather than obligating CIG to use said engine. The GLA further shows that CIG has an exclusive right, not a duty, to use the Engine in the Game. Through hiding the GLA, Crytek contorts the word “exclusively” to argue that the word means that CIG somehow is required to use the Engine in the Game. The plain language of the GLA where the grant of rights to CIG appears, plus the well-established concept of an exclusive license, instead establish that the word “exclusively” simply means that CIG’s right to use the Engine in the Game is exclusive to CIG and Crytek may not give that right to anyone else. Right, except that this agreement seems to be anything but plain language, and the license agreement actually differentiates the two concepts. Where 2.1.2 allegedly requires CIG to exclusively use the Crytek engine, the question about sublicensing is taken care of in the previous step of the agreement. 2.6 of the agreement basically just says that CIG can sublicense the engine only to contractor developers, with prior written approval by Crytek, for the purpose of developing the Game. This is one of those lines that is likely going to require witness testimony on what exactly the companies negotiated, assuming the Judge/Jury doesn’t accept either definition of exclusive as a given fact. 3. Do You Understand Crytek’s GLA? Does Crytek? Here’s an interesting note: You may notice in the passages from the lawsuit and license agreement that both parties say “the Game” (emphasis on the capital G in Game) regularly instead of Star Citizen when referring to terms that both parties agreed upon. There is a legal reason for this. No that wasn’t a mistake on my end, yes the GLA actually gets the name of the game wrong and refers to Star Citizen as Space Citizen, but that’s not the key issue here. This rolls into one of Crytek’s other claims, that the existence of Squadron 42 is a breach of the agreement because while it began as a mode for Star Citizen, it had since branched out into a separate purchase and, according to the license agreement, Cloud Imperium only has the rights to develop one game. Any time you see the word “Game” with the capital G, it is referring to “the game Star Citizen” and “the game Squadron 42,” combined together. Another section of the agreement goes further and states that the agreement does not include any game not accessed through the Star Citizen game client, or sold for a separate fee. This is why clarity is necessary, and here is where we lead to another issue that the court is going to have to decide. Crytek’s contention with Squadron 42 is that CIG announced in December 2015 that Squadron 42 would be a standalone product. 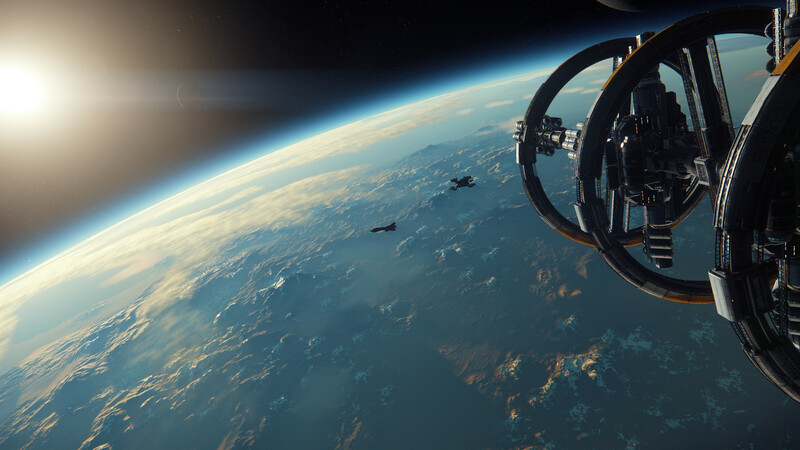 By December 2016, CIG announced that both Star Citizen and Squadron 42 would be moved over to the Amazon Lumberyard engine, and Crytek is going after the year that the game may or may not have been in development under their engine, claiming loss of royalties and upfront payments that would have been owed had CIG licensed a second copy of the engine. The big question is whether or not the license agreement which appears to explicitly recognize Star Citizen and Squadron 42 as separate games, but licenses them both together, is at odds with Crytek’s claim that selling Squadron 42 as a standalone product is a breach of the terms against selling separate products, or whether any of this is even applicable since neither game is using the engine. Another thing you’ll see crop up more than once if you read Crytek’s complaint is how the company graciously negotiated a substantially lower sum than its usual licensing fee on the grounds that Cloud Imperium Games would exclusively use the license and also heavily promote the CryEngine to its base. Since CIG is no longer using the engine, thus depriving Crytek of further licensing fees, the company feels that it’s been substantially damaged by not receiving the full, usual license fee. Money that they willingly gave up in negotiation. The licensing fee negotiated under the GLA reflected a substantial reduction from Crytek’s usual licensing fees in view of the promotional consideration and other consideration that Defendants promised to Crytek in Sections 2.8.1, 2.8.2,and 2.8.3 of that Agreement. In view of the fact that Crytek has been deprived of that promised consideration, Crytek has been substantially damaged, and has failed to receive the balance of its full, usual license fee. Crytek is apparently so angry about the conclusion of this agreement that they’ve taken to potentially slandering some individuals involved in the negotiation process. They actually call out by name Crytek co-founder Ortwin Freyermuth, who was a former Crytek employee and negotiated the deal on behalf of CIG, for apparent conflicts of interest and never recused himself from the negotiations or resolved that conflict of interest, despite apparently knowing confidential information about Crytek. Except that claim is allegedly a complete and outright lie. In the declaration presented to the court by CIG lawyer Jeremy Goldman in support of the motion to dismiss, who also kindly submitted a copy of the license agreement that Crytek for one reason or another had withheld, Freyermuth’s conflict of interest was never in question. In fact, Crytek not only didn’t have an issue with Freyermuth’s involvement at the time, they went as far as writing and signing a conflict waiver allowing him to take part. Goldman has this conflict waiver, apparently, and no doubt we will see it once this case goes to court. It seems like a lot of this lawsuit is intended to force CIG to keep paying Crytek royalties, because the company made the arguably poor decision to substantially lower its licensing fees on what they may have seen as a huge long term earner, they negotiated a contract that may or may not say what they think it does, and now they’re angry that the money train has stopped so they’re also throwing the guys who did the negotiations under the bus. 4. Why Would Anyone Write No Damages Into a Contract? One tactic that Cloud Imperium is using to quash this lawsuit before it ever goes to court is to point out that the license bars either party from seeking damages in the case of a breach of contract. If there are no damages that can be recovered, and in consideration of the fact that this lawsuit is popping up because CIG stopped using the engine and considers the contract scrapped, bringing this case to court would just be a massive waste of the court’s time, which when you’re trying to get a lawsuit dismissed this is a pretty logical avenue to go down. 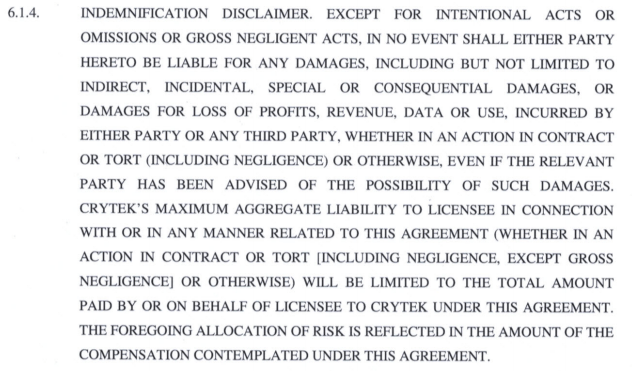 Crytek’s claim for damages — an essential element of any breach of contract claim — is precluded by express language in the GLA barring either party from seeking any damages from the other. The FAC also seeks various forms of monetary damages and equitable relief that are unavailable under the GLA or as a matter of law, including statutory damages and attorney’s fees under the Copyright Act, punitive damages, and an injunction. I read this response and honestly my first reaction was that CIG had grievously misread or is really reaching for something in the license. For the sake of clarity and the fact that it’s one of the few ALL CAPITAL LETTERS parts of the license, let’s look at that part of the agreement in its entirety. So neither party can be held liable for damages incurred by either party or a third party, even if advised beforehand on the possibility of damages. In their response, it looks like CIG is going for a more in-your-face approach to their motion to dismiss. House of cards pleading? Sham interpretation? Someone’s going for the jugular. In wrapping up this first bit of coverage, I’d like to share some disclosures. First, I am not a lawyer and nothing in this coverage or anything else on MMO Fallout should be interpreted as legal advice. As such, I try to refrain from making any judgement calls or act as armchair lawyer on how these lawsuits will proceed or which side has the more solid case, rather In Plain English has always been about presenting the allegations as-is and lining them up with publicly known facts and prior cases. Another note that I didn’t mention is that Roberts Space Industries is a defendant in the lawsuit even though the company claims it isn’t part of the contract as it didn’t sign. Indeed, RSI didn’t sign the GLA and isn’t even mentioned in the list of sublicensed companies, however they did license Autodesk from Crytek who are claiming that that is enough to keep them involved in the lawsuit. RSI is a subsidiary of CIG. I will be maintaining a publicly accessible Google Drive folder with the pertinent documents at this link here. Feel free to leave any thoughts or allegations of collusion/bias in the comments section below.